At Authentic Soccer, we offer the best in everything from training balls to game balls, in every size and for every surface, including futsal balls. What makes us unique is that every ball we sell, even mini skill balls, are customizable! Because there’s no minimum order, you can make sure that whatever kind of ball you choose is one-of-a-kind. Customize your ball with your name and number, text of your choice, your favorite team’s logo/flag, or send us a logo that you create. Your ball will be custom printed to your exact specifications for logo placement, color, and size. If you're looking for team balls, add your team’s custom logo to any of our balls to stand out against the competition. Add your team to the Authentic Soccer My Team program and get balls, uniforms, and more at a discount. What better way to show off your fancy footwork than by doing so in a pair of original customized soccer cleats? Authentic Soccer carries the best in soccer shoes from popular brands like Nike, Adidas, and Puma. Every shoe we carry is customizable, so you can freely express your personal flair with virtually limitless possibilities. Add your name and number, your favorite team’s logo or flag, or even send us a logo of your own design. The sky's the limit! Plus, our proprietary printing process results in durable, bright colors, meaning your design won’t wear out before your cleats do. Are you purchasing customized cleats for your team? See the Authentic Soccer My Team program to find full-team options, including at least 30% retail discounts for uniforms, cash back, and more. Most soccer bags are heavy-duty, with multiple compartments for separating clothing, balls, shoes, shin guards, and the like. Because there’s so much gear, soccer bags are specially designed for the sport. And, since there’s so much real estate to print on, your soccer bag can be a billboard for your individuality. At Authentic Soccer, get your name and number either embroidered or heat transferred onto your bag. You can also add your favorite team’s logo or flag, or have your own personal design put on your bag. Coaches and managers: If you’re purchasing in bulk for a team, please see the Authentic Soccer My Team program for details of how we can save you money on your uniform, bag, and equipment orders. 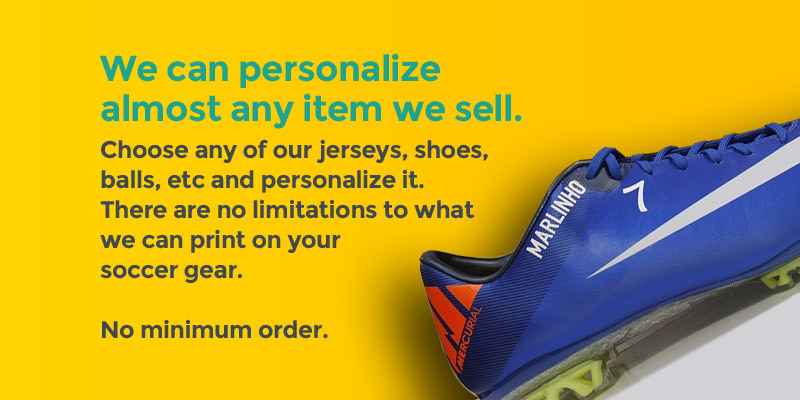 If you’re looking to personalize an officially licensed soccer jersey, you’ve come to the right place. We carry a large selection of world cup, national team, and club team items. Select from jerseys, shirts, shorts, jackets, pants, hoodies and more. All of our customized officially licensed items use the same authentic lettering (font/sizing/color) unique to each individual team, so you can be sure that the end product is authentic.